Republican presidential candidate, former Massachusetts Gov. Mitt Romney speaks to women in Chantilly, Va., earlier this month. Republican women are rallying to Mitt Romney — their party’s now-certain presidential nominee — boosting him to his best-ever showing on a fundamental measure of personal popularity, according to a new Washington Post-ABC News poll. Overall, Romney’s favorability rating still trails President Barack Obama’s, but the gap is far more narrow than it has been. In the new poll, 41 percent of all Americans express positive views of Romney; 52 percent do so for Obama. Just over a month ago, the president had a 56 to 35 percent advantage on this score. The shift among women comes after a period in which Romney’s Republican rivals withdrew from the race and announced their support for his candidacy. Romney clinched his party’s nomination in Texas on Tuesday night. Independents in the new poll lean negative on both Romney and Obama. Among all registered voters, the two presidential candidates draw split verdicts. On Obama, 49 percent of voters hold favorable views, and 48 percent negative ones. For Romney, it is an even 44 percent on both sides of the question, marking the first time since January that voter sentiment hasn’t tilted away from him. It is clear that Republican women are driving the increased support for Romney. Eighty percent of them now have favorable views of the former Massachusetts governor, up from 59 percent last month. The shift among women has pushed Romney to a fresh high among Republicans more broadly: As a group, 78 percent now hold favorable views of their party’s 2012 standard-bearer. About 84 percent of Democrats have positive views of Obama. 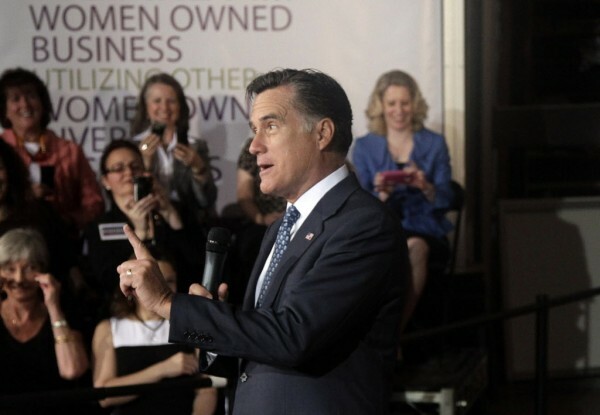 Republican strategists had several theories about why Romney is now winning over GOP women. Linda DiVall, a consultant and pollster, credited missteps by Democrats for Romney’s bounce with the group. “My suspicion is that a lot of that was ignited by the snide comments by Hilary Rosen on Ann Romney,” DiVall said, referring to the Democratic strategist’s remarks that Romney’s wife, a stay-at-home mother of five, had “never worked a day in her life.” Rosen later walked the comments back, and the Obama campaign quickly disavowed them. Since then, Ann Romney’s role in her husband’s campaign has continued to grow. She routinely introduces him at campaign events, and the announcement this week that she now has a full-time press secretary signals that her schedule will soon ramp up. Wednesday, the Romney campaign released a Web video, titled “Soul Mate,” that highlights the candidate’s support for his wife as she has struggled with multiple sclerosis. The Obama campaign is making an aggressive play for women, often noting that the president has appointed two women to the Supreme Court and early in his term signed the Lily Ledbetter Fair Pay Act, intended to guarantee women the right to sue for equal pay. His campaign will argue that Obama has shown a commitment to leveling the playing field since his first days in office. “President Obama has proven he is a strong advocate for women and a defender of the issues that are important to them and their families,” a campaign spokesman said in an email. Ayres argued that, besides Ann Romney’s appeal to GOP women, Democratic rhetoric on issues such as contraception and pay equity do not excite Republican women, who are primarily focused on the economy. That appears to be playing out. Although Romney is closing the favorability gap with Obama, the president continues to generate greater enthusiasm among his base than Romney does with his. Nearly six in 10 Democrats are “strongly favorable” toward Obama, compared with 35 percent of Republicans toward Romney. The new poll began on the Wednesday before Memorial Day weekend and concluded Sunday. A total of 1,021 randomly selected adults were interviewed. The margin of sampling error for the full poll is plus or minus 3.5 percentage points.